In 10 styles, made by top European craftsmen using traditional methods. All styles are available in portrait format only unless other wise stated. Complete with convex glass (unless other wise stated) and individually boxed. 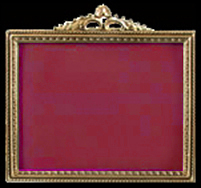 Rectangular portrait frame with convex glass. 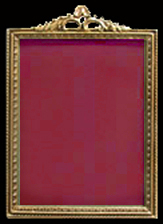 5 x 4cm 2" x 1 5/8"
Rectangular gold finish frames with inserted rectangular bezel mounted on moire satin covered backing. Fitted with strut and separate plain back. Convex glass. Satin colours available in light or dark blue and green. 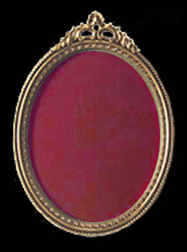 Rectangular gold finish frames with inserted oval bezel mounted on moire satin covered backing. Fitted with strut and separate plain back. Convex glass. Satin colours available in light or dark blue and green. Similar in design to Pattern 201 but without the ornate heading. All styles are available in portrait format only unless other wise stated. Complete with convex glass (unless other wise stated) and individually boxed. To see a larger image place mouse pointer over profile image. 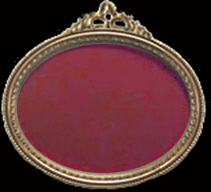 Available in a wide range of patterns, in portrait and landscape format, with convex glass. Supplied with velour covered back, and a separate back with strut to enable the frame to stand on a flat surface. Pattern numbers: 415, 507, 560, 584, 783, 818, 846. Prices as below. Pattern numbers: 601, 639, 784, 902 supplied with corner spandrels at an extra cost of £2.00. Exceptions are Patterns 783 and 784 that are not available in sizes smaller than 13 x 9cm and Patterns 415 and 912 that are not available in size 6 x4.5cm.